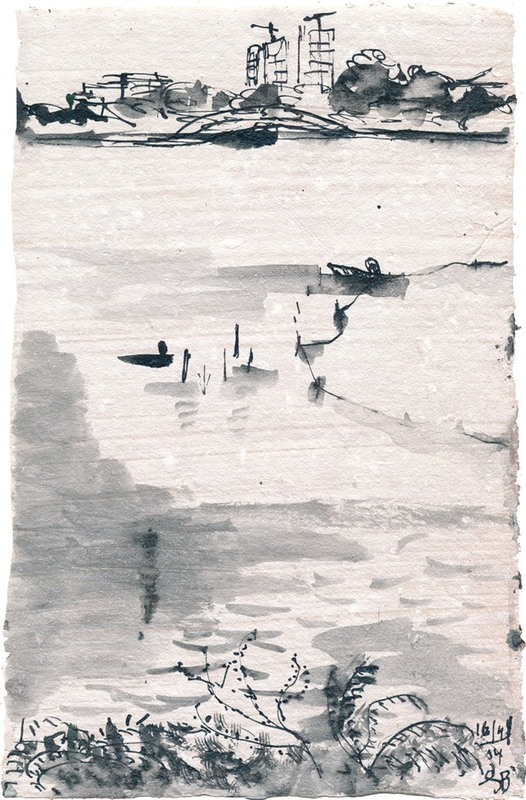 Painting of West Lake by Hanoi-based artist George Burchett. Around the time Admiral Charles Rigault de Genouilly (1807-1873), under the orders of Emperor Napoleon III, fired the first canon shots of the Cochinchina campaign (1858-1862) to lay claim to what would become France’s colony of Indochina, Paris embarked on an epic renovation project directed by Baron Georges-Eugène Haussmann, also under the Emperor’s orders. The plan was to modernise Paris and get rid of insalubrious slums – breeding ground for diseases as well as popular discontent. No doubt rich plunder from the colonies helped fund this – largely successful – imperial enterprise. Today’s Paris – with its elegant buildings, wide leafy avenues, graceful bridges over the Seine river – is mostly a 19th century city, built between 1853 and 1870. Only two high rise structures dominate the otherwise height-restrained Paris skyline: the Eifel Tower and the Tour Montparnasse. Futuristic office blocks and other modernist and post-modernist edifices are confined to the business district of La Défense on the city’s periphery. Thus Paris retains a certain architectural homogeneity and harmony, making it arguably the most beautiful and pleasant city in the world. Hà Nội was developed by the French colonialists as the administrative centre of Indochina along the same lines as Haussmann’s Paris. The result is the beautiful city we so much love, with the hustle-and-bustle of the Old Quarter and the French Beaux-Arts architecture, with tree-lined avenues, elegant villas and government buildings. A happy mix of native vernacular and French metric logic. Today Hà Nội is undergoing its own Haussmannian transformation, as the old makes way to the new, and the small and moderate to the big and ostentatious. And much of the “new and big” seems inspired by French “grandeur” with strong references to French Kings and their magnificent palaces. The French colonial developers were more modest in their ambitions than Hà Nội’s contemporary Barons Haussmanns. They built themselves a pleasant colonial capital, with plenty of shade provided by native trees, where they could work and relax while keeping relatively cool. They built an Opera to provide cultural entertainment, schools, hospitals, a History Museum, a Fine Arts Institute and various administrative buildings, still in use today. Of course, they did all this for themselves and to project French “grandeur” in distant corners of their colonial empire. But they did it well, even integrating into the colonial Beaux Arts building elements of traditional indigenous architecture. Hà Nội’s History Museum and Fine Arts Museum are good examples of that. But today’s Haussmanns seem to show little interest in local traditions. Their grandiose developments are inspired not only by French “grandeur” – Versailles and assorted châteaux and palaces – but by imperial Rome, with its Coliseums lined with statues of gods and goddesses. There is a fundamental difference, though, between Roman Coliseums and Circuses and their modern reincarnations in Hà Nội. The Roman Coliseums were dedicated to gladiatorial combat and other forms of bloody and gory entertainment, like chariot races, fights between wild animals or Christians being fed to lions. While the citizen of Rome and other cities of the vast Roman Empire were sitting in the shade and enjoying the “circus”, gladiators were hacking each other in the sweat-soaked and blood-splattered dust, under the blistering sun. But what justifies Hà Nội’s “Coliseums”, with their shade-less open spaces, entered through Triumphant Arches and lined with grandiose, generic statues of pseudo-Greco-Roman gods? There is no shade, no protection from the elements. Even the trees are imported species, secured with metal cables so they don’t get blown away by the wind. How do they relate to Hà Nội or to the rest of Việt Nam? Or are they designed to project some new form of imperial power with its neo-Olympian pseudo-gods? One of the most laudable contributions of French colonialism to Vietnamese culture was the opening of the École des Beaux Arts de l’Indochine, today’s Việt Nam University of Fine Arts. It produced several generations of talented Vietnamese artists. Copying plaster casts of classical Greco-Roman sculptures was part of the academic course in most traditional art institutions, usually in the first year of training. Then students moved on to live models and working from nature until they developed their own style and found their own unique artistic expression. The French art teachers at the École encouraged their students to find inspiration in their natural surroundings, their culture and traditions. So what lessons can young – and perhaps not so young – Vietnamese artists draw from Hà Nội’s new Colisseums and their gigantic pseudo-Greco-Roman statuary? Forget about your own culture and traditions, forget about the great art of previous centuries, just re-interpret antique imperial models, favoured by tycoons, megalomaniacs and Las Vegas casino developers? Is this what “new” Hà Nội is supposed to look like? The new Rome of South East Asia? One of the great attractions of Vietnamese culture is its taste for understatement and its harmonious relationship to nature. It is beautifully expressed in the sculptures that adorn pagodas, temples, dinh (communal houses) and other traditional public buildings. Even the French colonialists showed respect for the indigenous culture and nature. But not so the new Barons. Their model seems to be imperial Rome or the Versailles of French Sun Kings. Both proved unsustainable and their glory has long faded. *George Burchett is an artist, writer, translator and film-maker who was born in Hà Nội and now lives in Hà Nội since 2011. ‹ PreviousBáo động thú ăn chơi hủy hoại môi trường: Ăn tới… tuyệt chủng!